From the kitchen of One Perfect Bite...I love to serve this "salad" when we barbecue. It is, of course a play on the well-known Insalata Caprese and, as such, must be said to be a dish that is assembled rather than made. Taste buds as old as mine are always looking for new ways to do old things and this sport does just that, creating a warm salad with a creamy texture that plays well against the flavor of blood ripe tomatoes and pesto. The dish consists of thick sliced tomatoes that are grilled prior to topping with fresh mozzarella cheese. They are then broiled until the cheese becomes soft and starts to run. The tomato stacks are topped with pesto and served while still warm. I cook mine in a grill pan because I feel more in control of the process, but they can, of course, be done on a gas or charcoal grill. I usually make my own pesto, my favorite being a combination of arugula and cilantro, but any well flavored pesto, including a commercial variety, can be used. I draw the line with the cheese, however. This dish is not worth the effort if you don't use fresh, best quality mozzarella. It's also important to keep your tomato slices about an inch thick. Slices thinner than that will turn to mush before the cheese topping has the opportunity to soften and lightly brown. I have one last observation to share with you. Serve the stacks as soon as you possibly can. The cheese tends to lose its milky color and yellow if it sits too long. Here's how we assemble and cook this warm Insalata Caprese. 1) Preheat oven broiler. Season tomato slices with salt and pepper. Heat 1 tablespoon olive oil in a large grill pan until oil is wavy. Add tomatoes and cook over high heat until grill marks form, about 2 minutes per side. Do not overcook. Remove pan from heat. 2) Top each tomato with a slice of mozzarella and broil about 3-inches from heat, until cheese just starts to run. Transfer to serving plates. Top each stack with a teaspoon of pesto and drizzle with vinegar and reserved 1 teaspoon oil. Sprinkle lightly with sea salt. Serve immediately. Yield 4 servings. I can hardly wait for our fresh tomatoes...this will be one of the first things I make! Whenever we were invited to a bbq party, I always looked for the salad section first. :-) Yours definitely makes a perfect garden bbq salad. 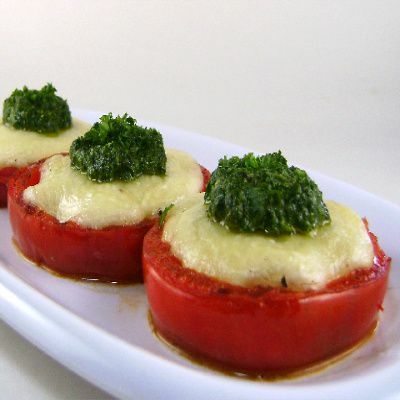 looks so yummy..sure i am going to try this one..i am sure its a good treat for tomato lovers. I'll save this for when my tomatoes get ripe. Great recipe, Mary. Can I ask you a question? The mozzarella looks yellow in the photo, rather than white. Is it a particular kind of mozzarella? ciao!! che bella presentazione e che buona!! bravissima come sempre! ciao! Wonderful twist on insalata caprese, Mary. I couldn't agree more on quality of mozzarella cheese, it's absolutely essential. The same goes for pizza. This is so good, Mary. I am used to bread and just a slice of tomato... this makes it so much healthier and it looks great too! Absolutely fresh and perfect !! lovely pics..
Mary, sometimes I think you knew my grandmother! This was her favorite way to eat summer tomatoes except it wasn't a side dish- she'd make a meal of it! questa ricetta viene fatta anche quì in Italia usando categoricamente mozzarella di " bufala ", perchè più buona in quanto più saporita. Però non l'ho mai assaggiata con il pesto genovese sopra. Personalemte a questa ricetta farei una piccola modifica ( se non ti offendi ) e cioè sulla mozzarella metterei solo il sale e non l'olio, in quanto l'olio viene poi aggiunto dal pesto. In questo modo credo che il sapore della mozzarella si sentirebbe meglio e non si avrebbe in bocca il sapore dell'olio. Oh yum this would be great along with grilled shrimp! I will definitely try this when we are back in Maine and the tomatoes come in. I make my own pesto and I am always looking for ways to use it. This looks wonderful! This looks yummy and I've never thought of it warm! I will have to try this -- what a great go with to grilled meat! What a wonderful take on caprese salad. Can't wait for tomatoes so we can try this one!!! What a delicious take on one of our favorite salads. It's always fun to serve a classic in a different way. I can almost taste the vine ripened tomatoes of summer. I will for sure try this! It looks awesome! Great presentation too! Hello Mary, nice to meet you. Thank you for calling in to my blog and leaving a lovely comment. I'm so glad you did. I have had a quick look around your blog and am off to look some more. I love to look at and try new recipes and will certainly be trying some of yours. There are a couple of other cookery blogs I love to follow too and my family is reaping the rewartds of these new discoveries. These are my favorite kind of recipes these days,quick, only a few ingredients and extremely tasty. I have the fresh mozzarella on hand but not tomatoes. This will be one of the first recipes I make when the tomatoes become ripe. Great recipe, this would be wonderful for mother's day. My mom would love this. Now I know what to prepare for my friend's barbecue this Saturday! It is delicious, a winner with everyone and so fast to make! I'm not a huge fan of veg but I love your kind of salad! Love the idea of adding a pesto on top for a touch more color. Looks great! I can't wait to try this. So simple, but so absolutely glorious. What a wonderful play on the traditional insalata caprese. I love this idea. This would wirk even for those tomatoes we have at the market out of season. The barbecue would make them smoky, caramelized and flavourful. We got one of those "Topsy Turvy" tomato growing things. I was skeptical...but the thing is loaded with tiny green tomato's! I love it, this looks absolutely delicious! What a lovely salad "makeover." And, the broiling/grilling adds a whole different flavor dimension. This is a great idea. I'm going to keep it in mind for when our summer tomatoes are ripe! Your stacked tomato salad is so gorgeous Mary! Looks like a lovely little meal all on it's own. Oh so perfect for summer! I can't wait to make this recipe with my beloved "Jersey tomatoes". Just gorgeous! What a beautiful, simple recipe Mary. And you're so right about the mozzarella - it's really not worth bothering with unless it's the good stuff! oh wow, this looks just mouthwatering, and beautiful! Right out of my dreams. Beautiful presentation. I am going to give this a try soon. We have lots of tomato plants but the tomatoes are just coming out. I'll have to make this with the store bought tomatoes when we get back. I am so loving this, I can taste it. i love every variation of Caprese. I've done it with pesto - but never grilled the tomatoes. You can bet I will be doing that soon! Gorgeous and packed with springtime taste. I'm taking a road trip this summer and will be camping a lot. I may try this on one of the grills. It sounds delicious! This is beautiful... Not just beautiful but it looks delicious.. I love mozzarella.. I love this idea of a warm caprese salad! You always have inspiring ideas! A perfect salad to serve with grilled meats--I love this take on a classic! Oh wow this looks SO delicious! I love this take on a classic and will have to try it. Thanks for stopping by!